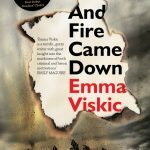 Emma Viskic spoke to Sisters in Crime’s national co-convenor, Robyn Walton, about her second Caleb Zelic novel, And Fire Came Down (Echo, 2017). The first in the series, Resurrection Bay, won three Davitt Awards and the Ned Kelly Award for Best First Fiction. 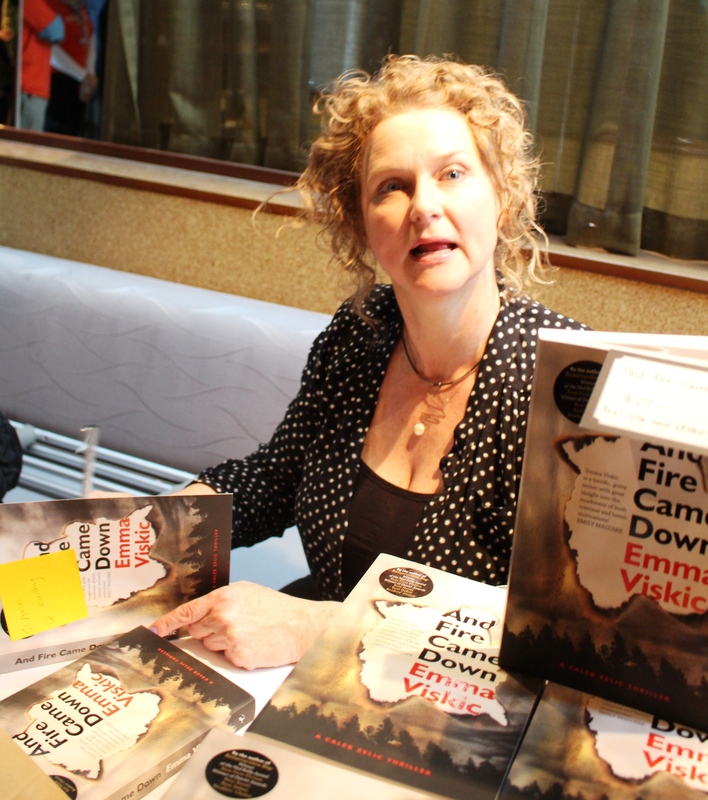 Emma, your first crime novel, Resurrection Bay, published in 2015, was a popular and critical success. So it was terrific to see your follow-up thriller welcomed with great reviews and bookshop exposure. How are you feeling about your writing life? Although I find writing incredibly hard at times, I also love it. I’ve been writing since I was four, but never really thought anyone else would be interested in my ideas. That other people seem to be engaging with my stories is really quite overwhelming. To be honest, I keep waiting for someone to tap me on the shoulder and tell me it’s all been an elaborate prank! Have you had feedback from overseas readers? The response from overseas readers and reviewers has been really positive. I thought people might struggle with the ‘Australianness’ of the books, particularly the dialogue, but they’ve taken it in their stride. I’ll be interested to see how US readers respond when Resurrection Bay is published there in April. We need to talk about Caleb. Has there been much commentary about you as a woman author featuring a man, Caleb Zelic, as your protagonist? Funnily enough, most of the commentary about that has come from me! Before I started Resurrection Bay, I’d assumed my protagonist would be a woman, so Caleb took me a bit by surprise. I tried to make him female at one stage, but it didn’t work. It took me a little while to work out why, but once I did it was a real ‘aha’ moment. I like flipping expectations and having a deaf male protagonist did that. While a deaf female protagonist would have felt too vulnerable, Caleb’s deafness made an outsider of that most invulnerable of things – a straight white man. The narrative of And Fire Came Down is told from the point of view of Caleb, although it is not written in the first person. Did you ever try writing Caleb in the first person? And Fire Came Down was always in third person. I experimented with first person when I was working on Resurrection Bay, but quickly dropped it because the voice didn’t work. First person made it feel like I was narrating the story, but Caleb’s voice came through very clearly when I used third person. I do like to keep it to a very close third person though, so I rarely use filtering words like ‘felt’ or ‘saw’. Caleb had a partner in his investigation business in the first book. This time around she’s mostly absent. Your reasons for doing this? And Fire Came Down is partly about the aftermath of trauma, and, without giving too many spoilers, part of that trauma relates directly to Caleb’s business partner, Frankie. He’s also emotionally isolated and struggling, so it felt right for him to be working without backup. In other words, I like making life hard for Caleb. Having said that, you’ll be seeing more of Frankie in book three. If I list some of the words repeatedly associated with Caleb in this second novel, could you update us in relation to his characteristics and ways of going about things? Caleb runs towards danger and away from emotional vulnerability. He will always push himself physically and mentally to the limit. This is exacerbated in And Fire Came Down as he’s struggling to cope with the events in Resurrection Bay. I wanted the landscape to reflect Caleb’s, and the town’s, discomfort, so I set the novel during bushfire season, with a dry, gritty wind and fraying tempers. The dirt and sand are sometimes positive too: Caleb’s ex-wife, Kat, feels a strong association with the land, and at one stage touches the sand to anchor herself emotionally. Poor old Caleb, he’s really down on himself at the moment. Feeling stupid is very much a byproduct of trauma, but it also comes from his upbringing. His late father looms large in his mind. Caleb feels as though he can never live up to Ivan Zelic’s expectations, and he’s very hard on himself because of it. Caleb’s pride means that he can’t accept help, but he’s desperate to give it. His need to help people comes from his need for action, and because he blames himself for causing his loved ones pain. Sometimes with good reason. Caleb’s efforts at spying and breaking-in are sometimes comical, especially as he gets himself into situations in which he won’t be able to lip-read. How do you get the ideas for Caleb’s investigative blunders and successes? Caleb is far braver than me, so if he’s in a situation that would panic me, I often make him act the opposite way I would. The blunders are far easier for me to imagine because slapstick comes naturally to me. I can neither confirm nor deny that the scene involving Caleb and a public toilet was inspired by one of my own misadventures. There’s tension in Caleb’s relationship with his estranged wife, Kat, but also tenderness. Similarly, Caleb’s relationship with his one close blood relative, his brother Ant, is on and off, mutually supportive but also scratchy. Caleb couldn’t handle full-time harmony? Or is it a case of the narrative requiring personal stresses? Caleb definitely has a problem maintaining harmonious relationships. He feels deeply, but, as one reviewer succinctly put it ‘is emotionally constipated’. Fear of failure prevents him from easily admitting to any vulnerability. That makes life hard for him and everyone around him, but is a gift for me as a writer! Your dialogue and one-liners can be laugh-out-loud funny, and you use the Australian vernacular with ease. Do you listen out for humour and sayings and speech rhythms, or invent them, or what? All my dialogue is invented, but a lifetime of eavesdropping means I’m keenly attuned to the Aussie vernacular. My background as a classical musician also helps me tune in to the natural rhythms of speech. I ‘hear’ the dialogue in my head and also practise it out loud, often while I’m out walking. Are there conversations or characters you had special pleasure or satisfaction creating? I loved crafting the banter between Caleb and his brother, Ant, and really enjoyed writing Ant’s character. He’s a mix of vulnerability, sweetness and sadness that Caleb sometimes finds irritating but I find very endearing. I also enjoyed writing the scene where Caleb and Kat communicate through tactile sign language. Tactile signing is used by deaf/blind people. The ‘listener’ holds the signer’s hands and feels the signs being formed. 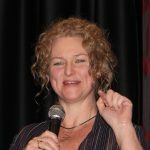 I first came across it when I was learning Auslan, and thought it was beautiful and incredibly intimate. I’ve been waiting for the right moment for Kat and Caleb to use it. One character is named after a real-life person who won a ‘Be Immortalized in Fiction’ competition. Can you tell us a little more about that? That was an interesting challenge! The competition was won by Kate McKay, which presented me with a bit of a problem, as the name ‘Kate’ was too close to ‘Kat’. Kate and I exchanged a string of emails and settled on using her mother’s name, Joy. Once I had the name Joy I knew exactly who the character had to be – a cranky receptionist having a very bad day. She only appears in one scene, but I really liked her and thought the contrast between her spiky nature and the name Joy would be perfect. Last word to you, Emma. Are there other aspects of the novel or its background that you’d like to draw to readers’ attention? And Fire Came Down deals with racial tensions and the intricacies of Koori family structures and politics. I’m often asked what research I did to write it, but it wasn’t ‘research’ so much as life. I have Koori family I’m very close to, so I have a very similar perspective to Caleb in that I’m a privileged outsider. I don’t think I would have written And Fire Came Down without that.